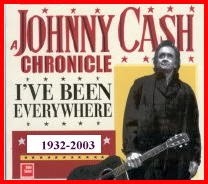 ORIGINAL SONG: "I've Been Everywhere", Geoff Mack 1959, covered by Lucky Starr, Hank Snow, Johnny Cash, Stompin' Tom et al. 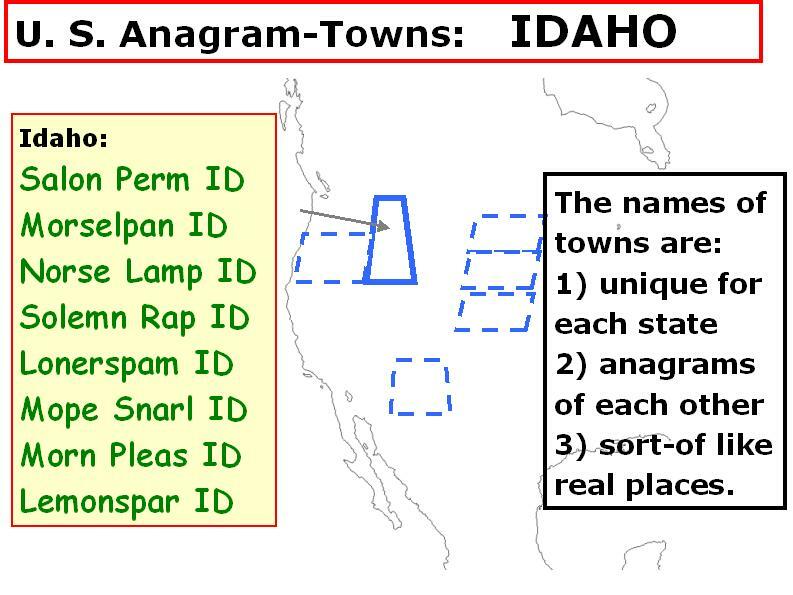 WORDPLAY LINK: An explanation of the derivation of the anagrammatic place-names, and an extensive lists are found at our sister-bloog "Edifying Nonsense" post #32 , using the tools of creative cartography. 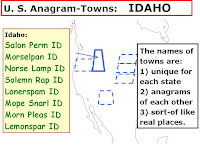 Explanatory Note: The site editor, a great fan of palindromes, recently made the discovery that the letters in the word P-A-L-I-N-D-R-O-M-E-S make a great base for anagrams, and that many of the quirky results sound like place names. But, strangely, if you look carefully at an atlas you will find many places with names almost like these..... Canadian readers will acknowledge the similarity to Red Deer or Medicine Hat, Alberta, and Moose Jaw, Saskatchewan; Americans will recognize the similarity, given the naming by early international explorers, of Green Bay, Des Moines and El Paso. This American patter-song-parody is more rigorous than the original Johnny Cash version, in using only place names from the United States (including PR - Puerto Rico). Place names from other jurisdictions, particularly Canadian ones, are excluded (in reality, all of these are stipulated by the initial designation of a postal code). However those interested in a Canadian take on the song are invited to view a post 'under construction' dealing with this issue. Cause you start off every morning, Jumble puzzle in your hand." Because I've scrambled and resorted every phrase like "SPOILER DAMN". And Solemn Rap, Mope Snarl and Lonerspam ID. Seal Prion, Reasonlip, Sailor Pen, Spiro Lane. Keep your SALMON PRIDE . Demo Plans, Modelspan, and pay attention! - Seldom Nap. For the remainder of the song (9 more verses and choruses) see post #121.